Wintry weather brought snow, rain and floodings to Southern California Thursday as a so-called king tide flooded Sunset Beach and other areas. Water washed over streets and parking lots in the Orange County beach community, as dogs gamboled in the water and a man in flowered swimming trunks stood outside his home with a fishing line. In the mountains, meanwhile, Thursday's forecast called for up to eight inches of snow above 6,000 feet. 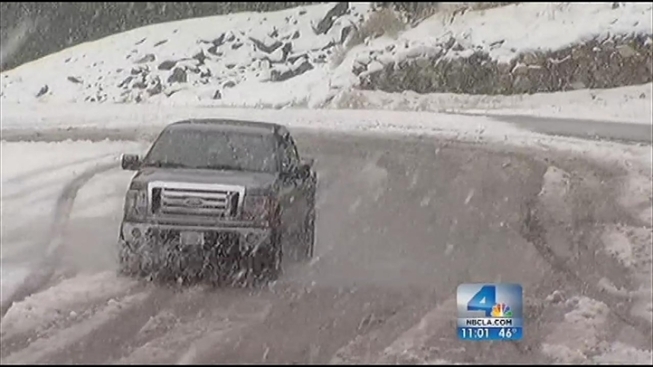 Riverside County was under an extreme weather advisory for most of the day. A flood advisory issued for the northwestern portion of the county lasted until 5 p.m., and a winter weather advisory for Idyllwild, Pine Cove and Vista Grande was in effect through 10 p.m. Many streets and neighborhoods in Moreno Valley were a muddy mess Thursday after flash flooding. The area was pounded by rain Wednesday night into Thursday morning, and the lower portion of the valley was hit hardest. Jacob Rascon reports from Moreno Valley for the NBC4 News at 5 p.m. on Dec. 13, 2012. 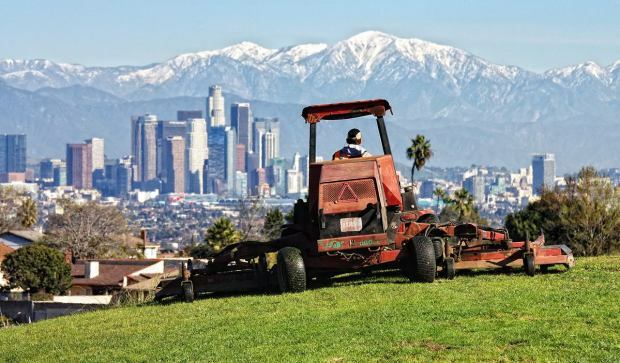 Temperatures in the L.A. basin hovered in the upper 50s to lower 60s on Thursday. Another storm system is expected to bring more wet weather Friday. Overnight, a dusting of snow may hit the Golden State (5) Freeway as it passes over the Grapevine. The weather service warned of "hazardous driving conditions," and said reduced visibility may be caused by precipitation and/or gusty winds of up to 45 mph in the San Bernardino Mountains and high deserts. "The motoring public needs to understand that they need to actually plan ahead, give themselves a little bit more time to travel, slow down, and of course buckle up," said California Highway Patrol spokesman Officer John Lutz. Lutz said he didn't expected the 5 Freeway to be closed over the Grapevine. "The combination of wet snow and low temperatures in the mountains could create a dangerous situation for campers and outdoor enthusiasts that are not prepared for the change in the weather conditions," the weather service warned. It was a wet beginning to the day Thursday for residents of Sunset Beach. A "king tide" washed over streets and parking lots in the Orange County beach community. Residents say the water started rising fast just after 8 a.m. Thursday. 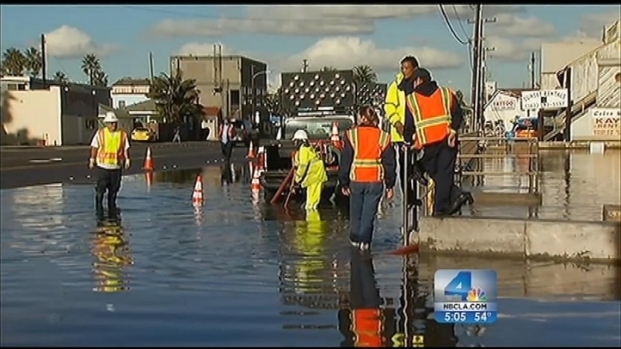 Angie Crouch reports from Sunset Beach for the NBC4 News at 5 p.m. on Dec. 13, 2012. The Los Angeles County Public Works Department was expected to close several roads Thursday night should the conditions warrant it. The closures will be in effect until the storm has passed. More information is available at www.dpwcare.org. Conditions should dry out during the daytime Friday, and then a weaker storm system may bring precipitation that night and into Saturday. More rain may following Sunday and Monday morning.